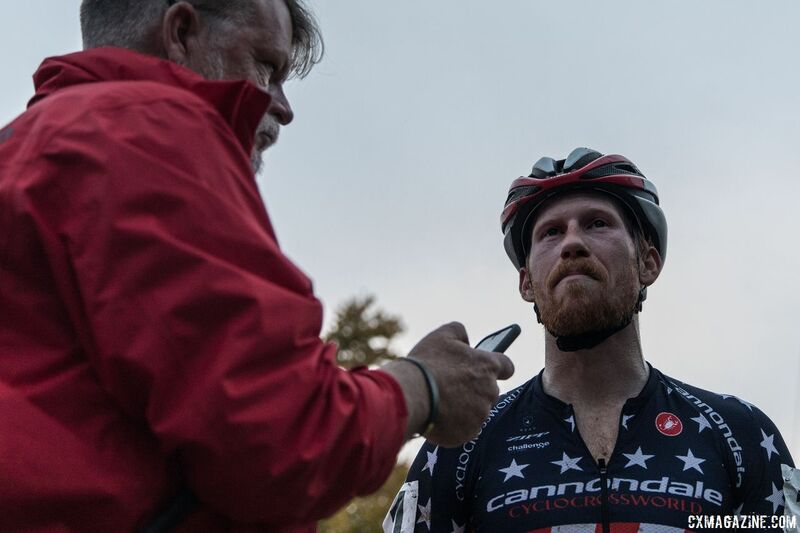 Stephen Hyde (Cannondale p/b Cyclocrossworld.com) came into Saturday’s Derby City Cup race on a roll. 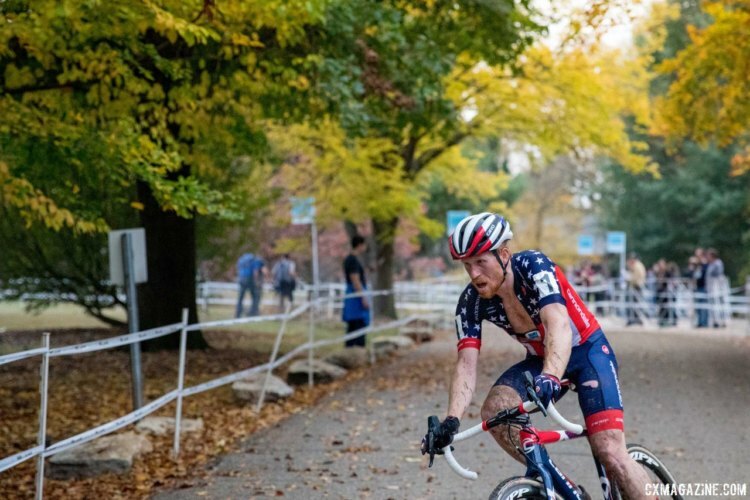 After a slow start to the US Cup-CX series due to illness and impressive riding by Tobin Ortenblad (Santa Cruz / Donkey Label Racing), Hyde came into Louisville on a three-race winning streak after an impressive weekend in Cincinnati. With $12,500 within reach, he was sitting in a good place. 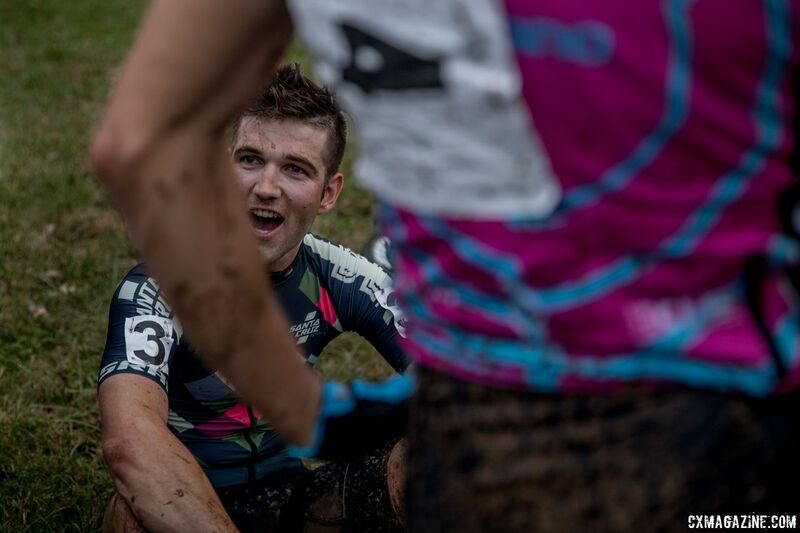 For Ortenblad, Saturday’s race was a chance at redemption. 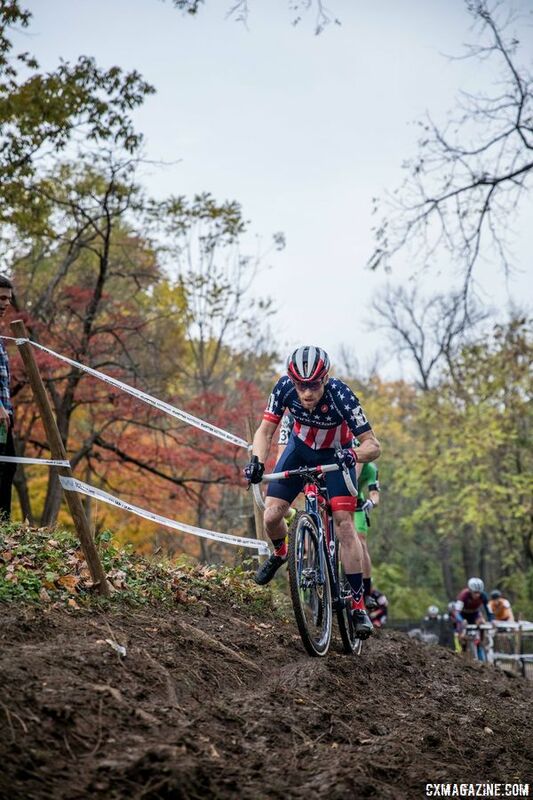 When he packed his bags for Cincinnati, he was sitting on top of the US Cup-CX standings after a monster beginning to the month of October. When he left caked in the Kentucky and Ohio mud, he found himself in fourth place and fighting for a spot in the money. Ortenblad’s mercurial journey through the US Cup-CX contrasts with that of Kerry Werner. 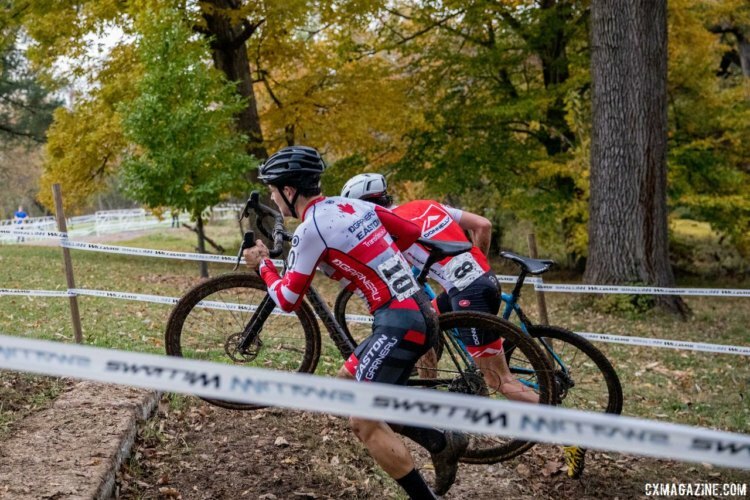 Werner has calmly and assertively ridden himself into the conversation of top U.S. Men’s cyclocross riders. 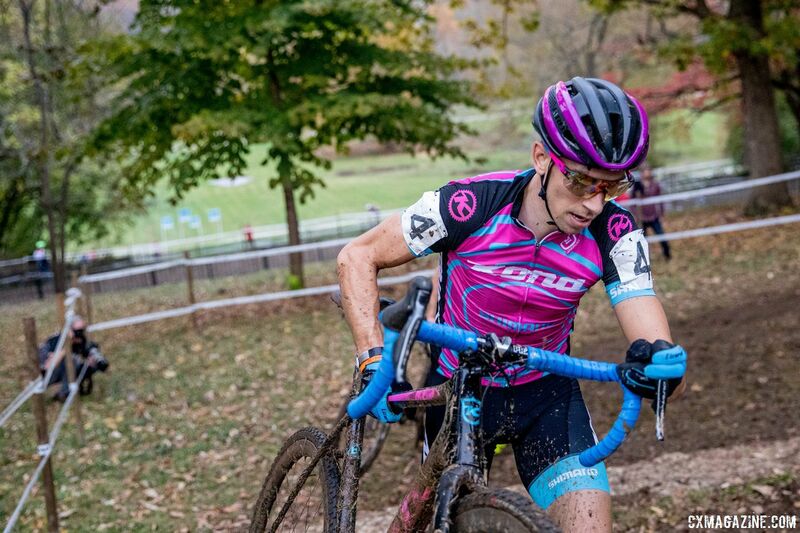 Werner has finished in the top six at each of the series races and also took home two wins at DCCX two weekends ago. 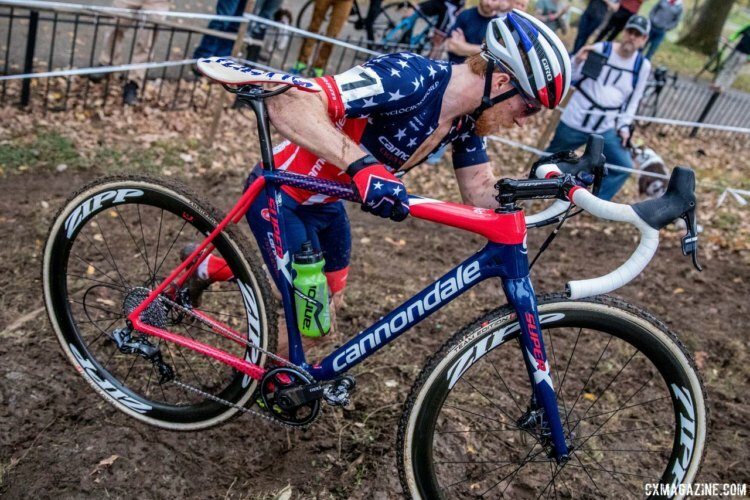 Catching Hyde would be a tall task, but Werner was sitting in a solid second in the US Cup-CX standings thanks to the steady finishes he has been turning in all season. The star of last Sunday’s race was young Gage Hecht (Alpha Bicycle – Vista Subaru). Hecht attached himself to Hyde’s wheel at Harbin Park and stayed there for most of the race. 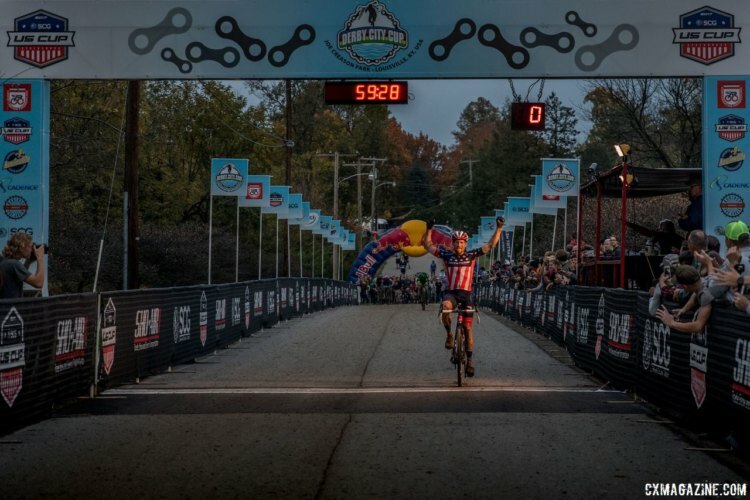 An impressive performance by one of the young U.S. cycling stars, no doubt. 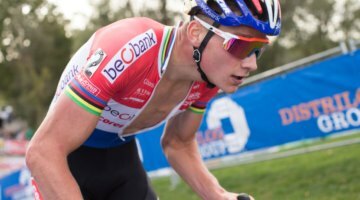 Hecht said he was surprised by his ride on Sunday, but if he could repeat the feat again on Saturday, it would be a sign he is fully ready to join Spencer Petrov (Aspire Racing) as one of the promising young stars of U.S. cyclocross. 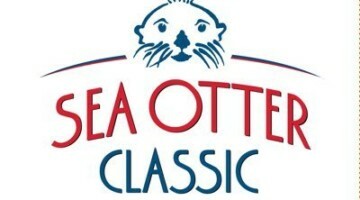 Saturday’s race at Joe Creason Park had a little bit of everything at stake. Triumph. Redemption. Breakthrough. Which story would be told on Saturday at the future home of the 2018 Cyclocross Nationals? The characters at the center of our story wasted little time trying to fulfill their destiny on Saturday. 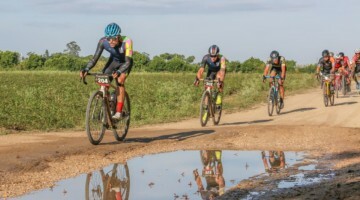 After riders cleared the descent near the Parks Department mansion and hit the second climb, Ortenblad, Hyde, Hecht, Werner and Hector Riveros (Stan’s NoTubes p/b Maxxis / Construction Zone Racing) were already off the front. 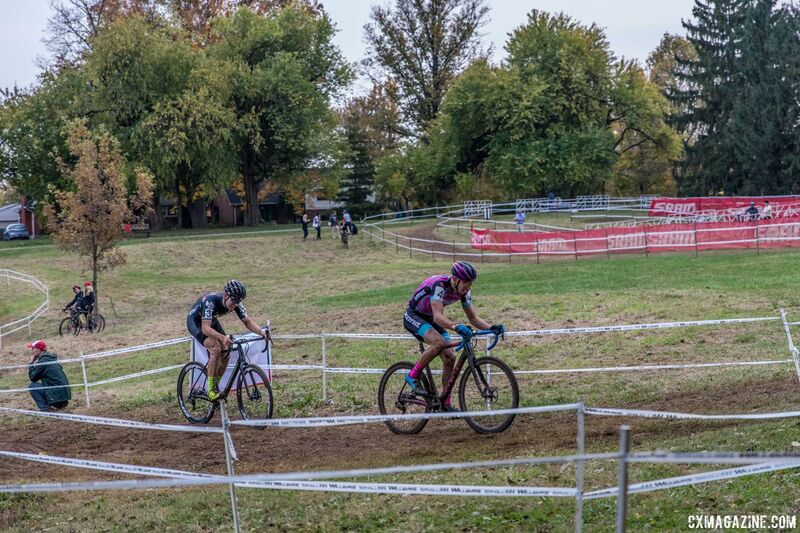 Riveros, a Washington native and relative newcomer to the Elite scene, was ready to prove he belongs with the royalty of U.S. cyclocross with his fast start. After the first lap, a chase group of four formed behind the lead five. With the leaders perhaps wary of going too early on the tough Joe Creason course, the chase group slowly closed the gap and when the two groups descended into the valley for the second time, the two groups were close to becoming one. There would be no union of the two. Just as they had done during the first lap, the lead selection exploited the climbs up and down the valley to escape the other riders. Two laps in, they were away. The win would likely go to one of the race favorites. The third of seven laps brought the first action to the lead selection. After his heroic start, Riveros fell off the pace around the tennis courts and dropped back into the chase with Michael van den Ham (Garneau-Easton p/b Transitions LifeCare), who was sporting his new Canadian National Champion kit, and Eric Brunner (Evol Racing), who was looking for another impressive performance after finishing in the top ten at Cincinnati. At the start of the second climb, Hyde and Hecht put in a little dig and opened up a small gap on Ortenblad and Werner. Werner quickly brought the move back, but Hyde and Hecht had put the others on notice. Hyde was ready to force the action and Hecht was ready to follow the leader. The next time around the tennis courts, Hyde ripped the race wide open. Hyde went and Hecht followed. Ortenblad and Werner were left in their wake. The gap was quickly a massive 15 seconds at the descent near the mansion. Boom, goes the proverbial dynamite. The stage was set for the second straight battle between the master and apprentice. Last weekend, Hyde said he had to work incredibly hard to shake Hecht. On Saturday, a flat tire gave him a solid assist. Hecht flatted on a rock somewhere on the second climb. Hyde pulled away as Hecht faced the painful struggle up the last of the three climbs with no air in his rear tire. Hyde was gone, Hecht rejoined the chase. Hecht was semi-okay with the flat. “I think that flat was almost a blessing in disguise because it took me back to that group and gave me a lap to kind of get my legs back,” he said. Hyde’s lead off the front was quickly near 20 seconds. Hecht has shown strength riding with Hyde, but closing 20 seconds on the defending National Champion is a large ask. Hyde was likely on his way to the win and the US Cup-CX title. The chase group rode together through the fifth lap and into the sixth. There was a sense that Hecht was the strongest of the three, but had he lit all of his matches trying to stay with Hyde? 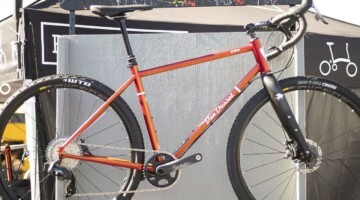 Time was drawing nigh for one of the riders to make something happen. That rider was Hecht. Hecht sprung into action on the last climb out of the valley and stayed on the gas past the pits. His committed move netted him six seconds on the other two riders. It seemed the legs were still there. Earlier in the race, Hyde hit his front wheel on one of the barriers while trying to bunny-up the obstacle and came down hard on his quads. If Hyde was hurt, he was hiding it well, but when the riders entered the bell lap, Hecht had closed the gap a bit. 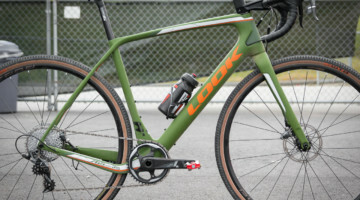 When Hyde passed the pit and descended into the valley, Cannondale p/b Cyclocrossworld.com team director Stu Thorne could be heard yelling out a seven-second gap. Hecht was closing and with Hyde’s sore quads, the young rider had a shot at pulling off one of the shockers of the season. 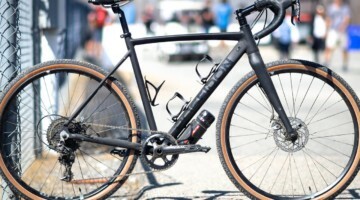 Shortly after getting the update from Thorne, Hyde sprung to life on the first climb and through the technical off-camber section. In a few hundred meters, he doubled his lead. 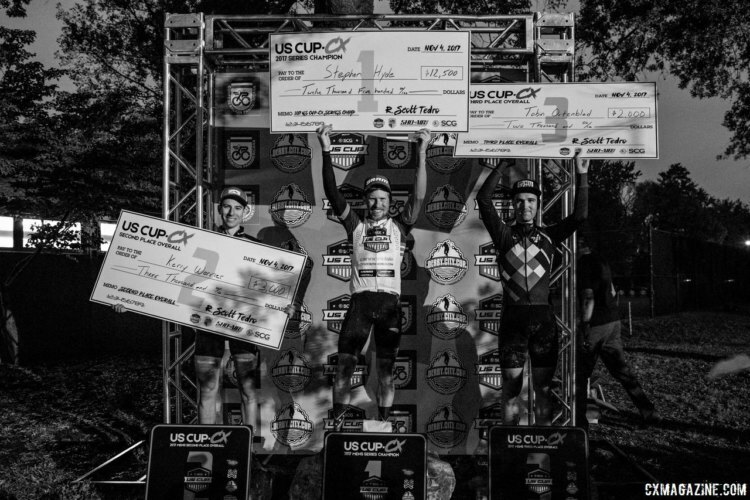 The win and the US Cup-CX championship were secure. 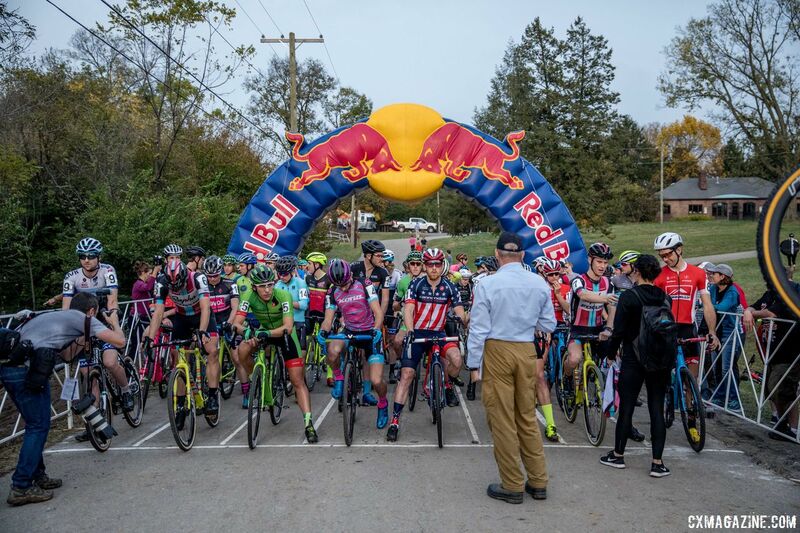 Hecht’s consolation was a second-straight Elite second place against the best riders in the U.S.
After Hecht left Werner and Ortenblad, the two locked horns deep into the last technical section of the course. Ortenblad led the way into the last technical ditch and emerged from the section first, but Werner jumped his wheel and quickly seized the upper hand in the finishing sprint. Third place belonged to Werner, and Ortenblad took fourth. 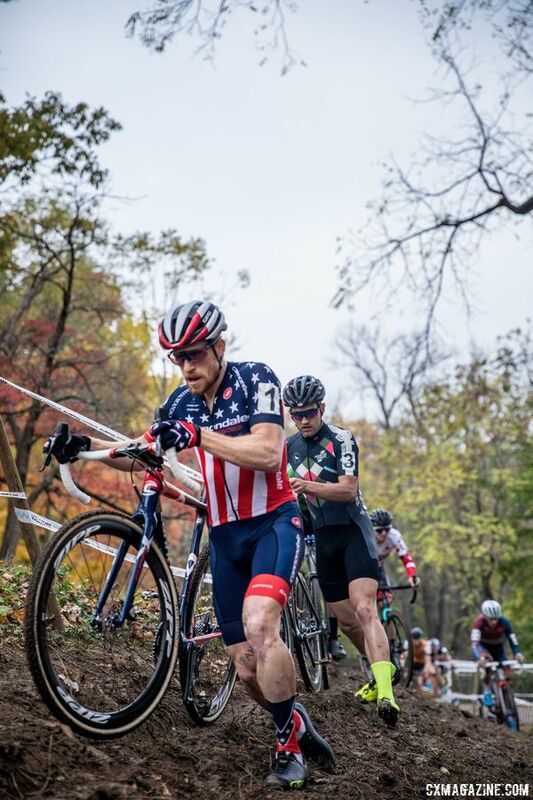 Ortenblad entered Saturday needing to finish two spots ahead of Curtis White (Cannondale p/b Cyclocrossworld.com) to take third in the US Cup-CX series. White finished seventh and the $2,000 belonged to Ortenblad. As he often does, Jamie Driscoll (Donnelly Sports) came charging back late in the race and nipped Riveros in a sprint to take fifth. Hyde’s win gave him the overall US Cup-CX prize of $12,500. Werner took home $3,00 for second and Ortenblad $2,000 for third. 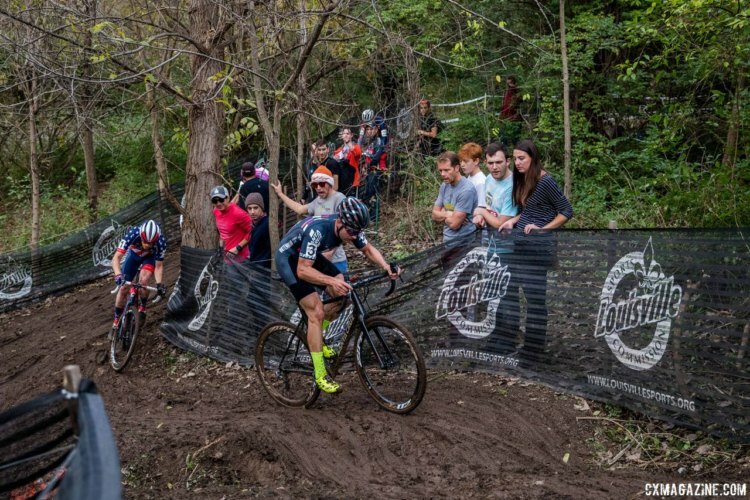 Stay tuned to Cyclocross Magazine for our continuing coverage of the 2017 Derby City Cup.